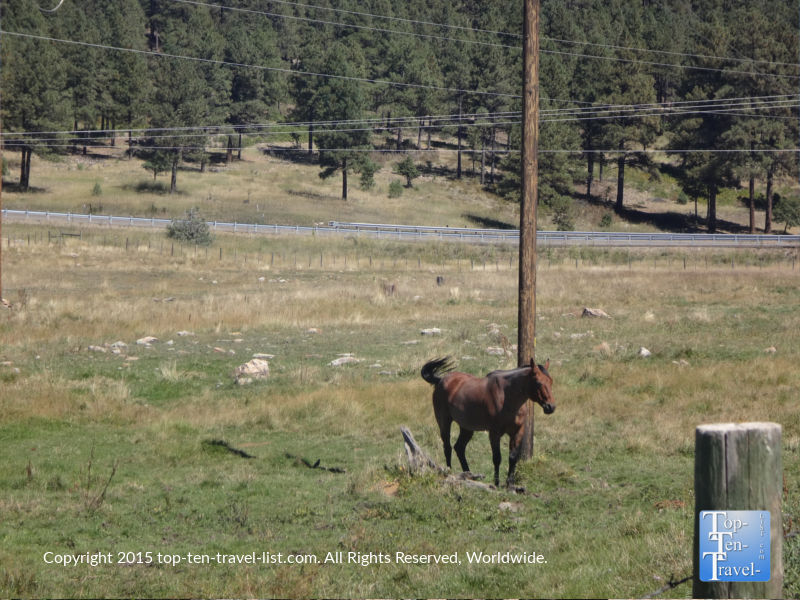 A Scenic Horseback Riding Adventure through the San Juan National Forest - Top Ten Travel Blog | Our experiences traveling throughout the US. 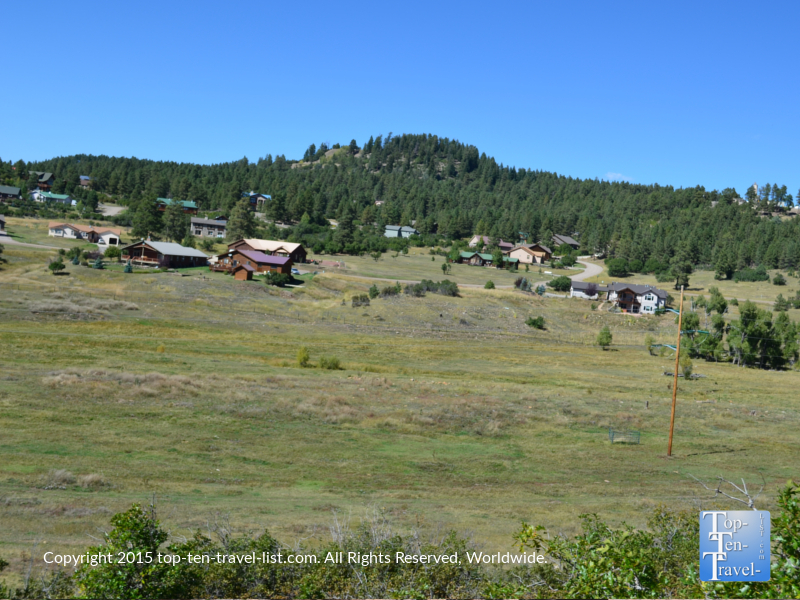 Pagosa Springs is a little town in Southwestern Colorado known for its’ beautiful scenery, hot springs, and abundance of adventure/nature related recreation activities. 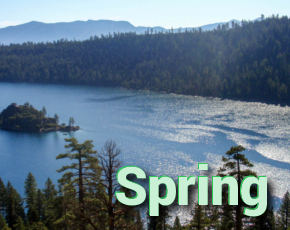 This four season destination offers many diverse recreational activities, allowing you to enjoy the gorgeous views year round. 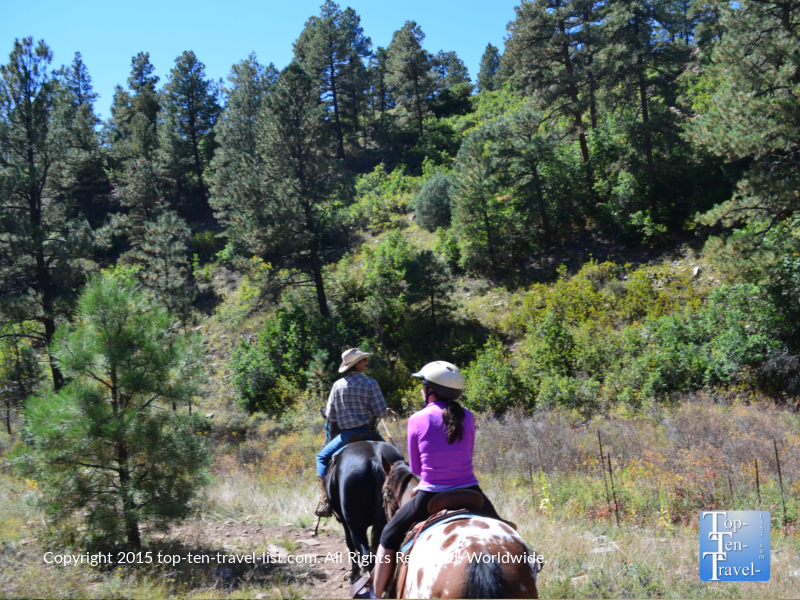 Aside from the most popular activities like hiking and mountain biking, taking a guided horseback riding adventure is another fantastic way to enjoy the gorgeous San Juan National Forest. 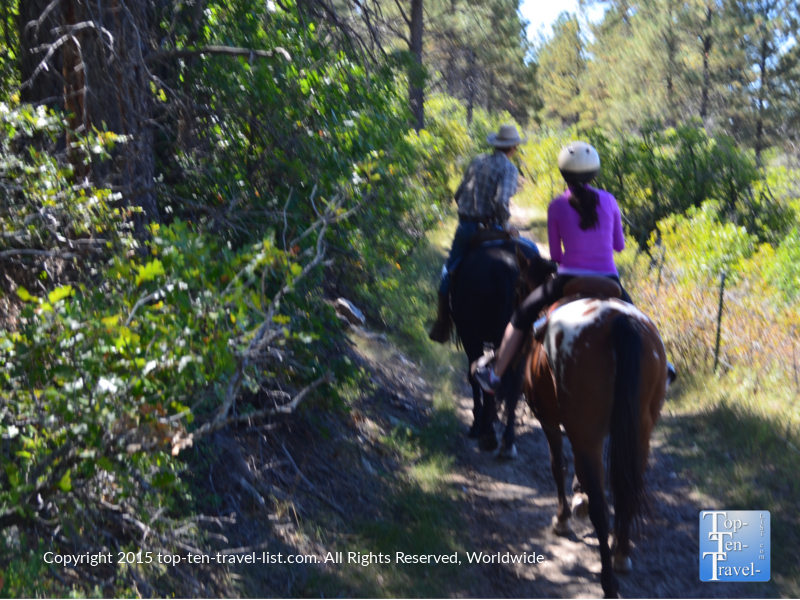 For those looking for a new way to explore the outdoors, a peaceful guided horseback ride is the way to go. It’s much different than exploring an area by hiking or biking, yet still fun and even more peaceful. 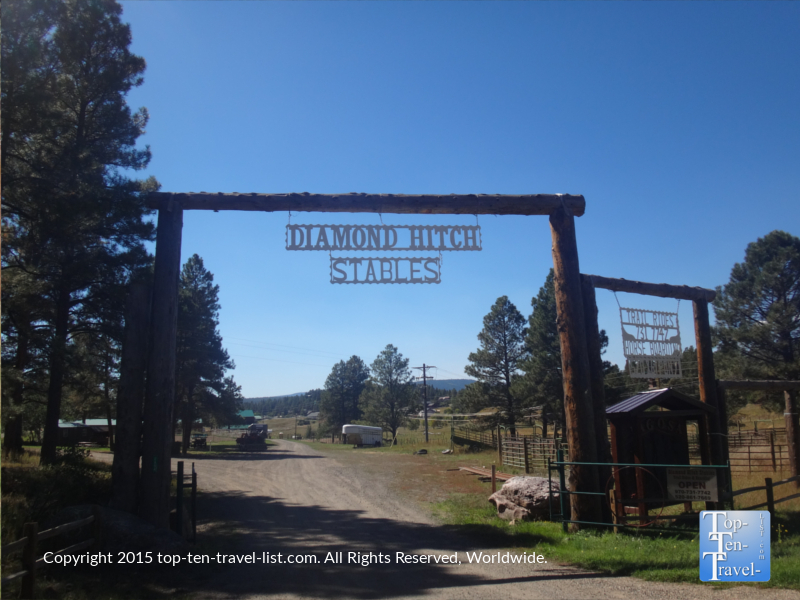 There are several companies that offer rides in the area, however, I recommend Diamond Hitch Stables for beginners. This wonderful company has excellent guides who know how to work with beginners, in addition to well trained horses that are great for those who are nervous on their first time out. Your guide will be excellent at explaining everything about riding (you will get to mark on your release if you are a newbie or an experienced rider), so you should feel much more comfortable. 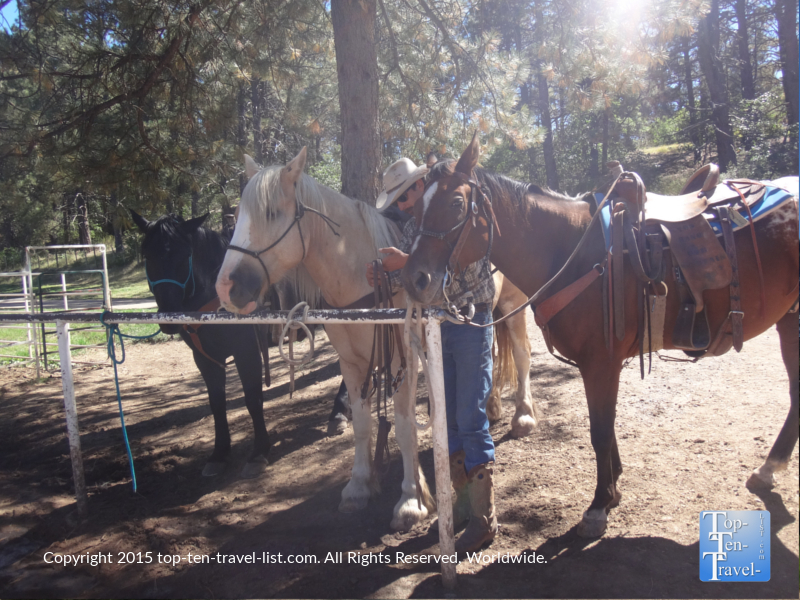 For beginners, horseback riding can be a really scary experience (especially when taking a trail ride in a mountainous area), so having an experienced, helpful, & friendly guide really does make all the difference. Our excellent guide at Diamond Hitch was very knowledgeable about riding and gave out great instructions for beginners. He also had no problem helping anyone guide the horse, if needed. 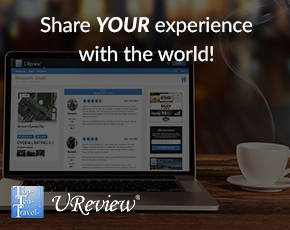 He was very personable and we had as much fun talking to him as we did riding and enjoying the natural views. Aside from beautiful views of the San Juan and Weminuche mountains, you may also come across some area wildlife. Deer, elk, and black bear are frequently sighted in the area. Bighorn sheep, cougars, and turkeys are also occasionally spotted. We were informed of a resident bear in the area which is seen on a daily basis, unfortunately it was a bit too hot on our afternoon ride so he was probably taking shade somewhere. On the bright side, we did come across 2 deer, just off the trail. Unfortunately, taking pics while horseback riding is not easy. If you look closely, you can see deer in the distance in the photo below. There are several trail rides to choose amongst at Diamond Hitch stables, from a quick half hour journey to a 2 hour adventure. An hour long ride and dinner can also be booked. I recommend the 1.5 hour ride, which was the perfect amount of time to both enjoy the scenery and clear the mind. Our half hour ride took us on a scenic & peaceful adventure through Martinez Canyon in the San Juan Wilderness. 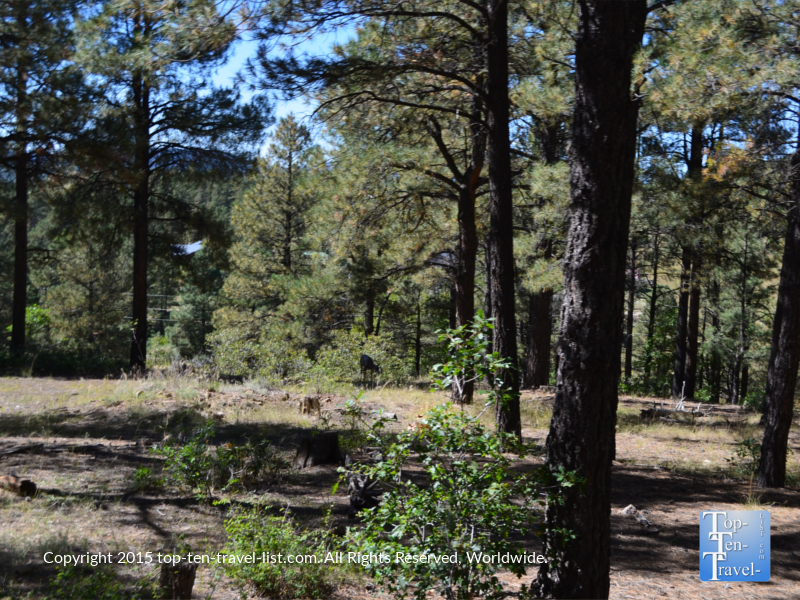 It was wonderful to be in such a quiet, natural environment with no traffic, business, or crowds – just the picturesque views of the forest and the occasional wildlife sighting. If visiting during the colorful fall season, you will be treated to the amazing yellow, orange, and red hues of the Pagosa Springs fall foliage season, known to be pretty spectacular. Unfortunately, our late September ride was just a few weeks off and we only caught a small glimpse of the colors to come. 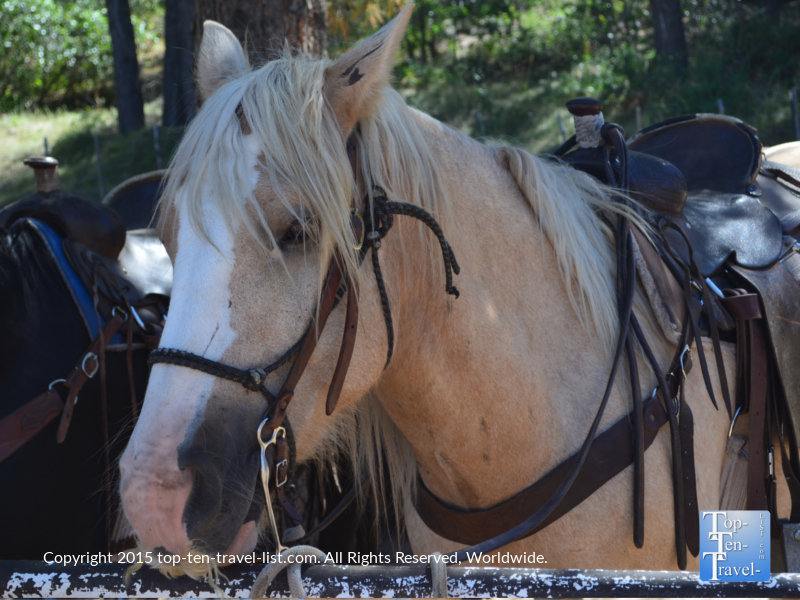 Although horseback riding is relaxing, be aware that you are still going to get a workout! Expect your lower body to be a bit sore if this is your first time out. This is where a trip to the incredible hot springs comes in handy (Pagosa Springs is home to the deepest hot springs in the world!). A relaxing soak later in the evening after your ride will help to soothe your aching muscles and further enhance your relaxing vacation. Taking a horseback ride through the quiet San Juan National Forest is a memorable experience, a much needed break from today’s hectic schedules. All too often we forget the natural beauty that surrounds us as we are too wrapped up in our daily routines. 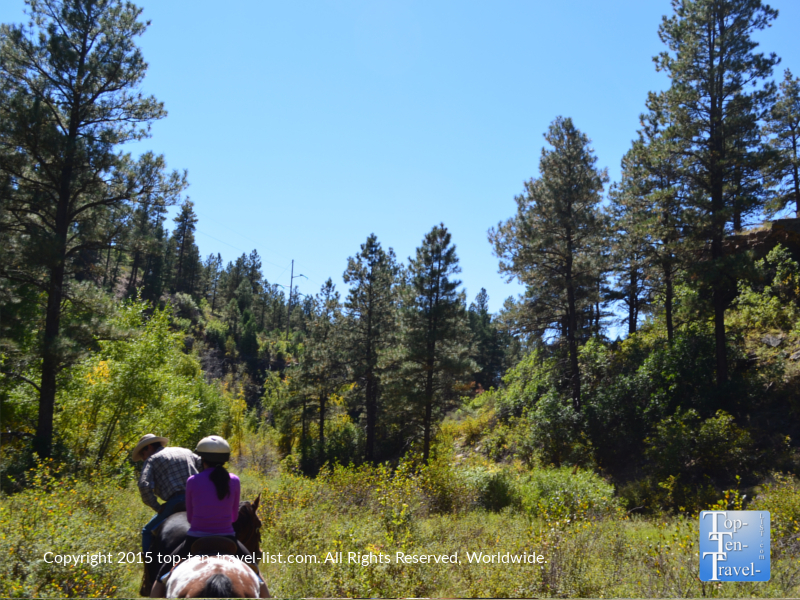 Turn off the technology and make a reservation for a peaceful guided horseback riding adventure in Pagosa Springs: it will be one of the best things you will do on your trip! Instead of simply strolling the shops and restaurants downtown, be sure to plan some time to take advantage of the 100s of miles of natural beauty which surround this small Western city. Prices are surprisingly affordable. The hour and a half ride was only $55 per person.